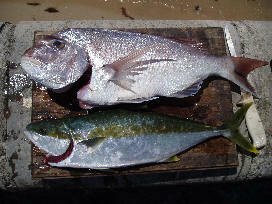 Yellowtail Kingfish reach over twenty-five kilos and are the only real game fish the bay as to offer other than Sharks. The place to chase Kingfish is in the Rip and along the Lonsdale wall. Many locals’ fish for them using a technique of slowly trawling with strong handlines baited with squid. If the conditions are favourable trawling with medium sport fishing outfits is also productive. Lures such as Konaheads, rubber squid and minnow styles are all productive. Kingfish are also encountered when fishing for Salmon as the occasionally mix into the salmon school. Each summer a few kingfish are caught off the Mornington coast, while they are normally a by-catch some anglers do target them with some sucess.